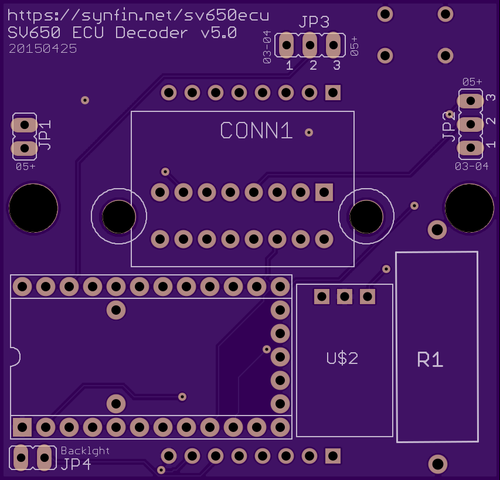 So I’ve learned that the LED lights and LED display that I’ve used in earlier versions of the SV650 ECU Decoder have the unfortunate issue that the LED display is completely washed out in daylight. The LED lights, even though they are 10mm are hard to see as well. 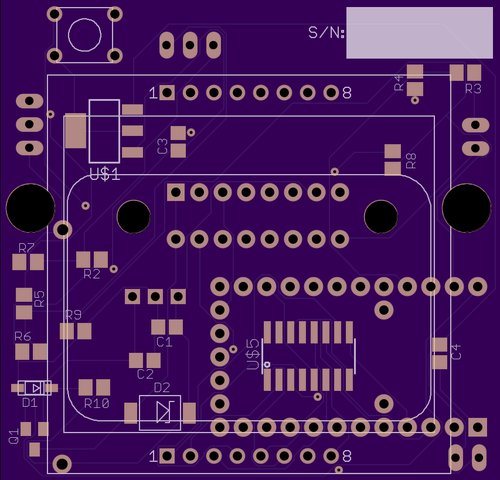 Hence, I’ve redesigned the board around the Nokia 5110 LCD display. These display was originally used in cell phones and being LCD should be easier to see in sunlight. Suzuki even used a LCD display in the OEM dash. The biggest challenge with using a LCD display was finding one which would fit in the existing footprint. I really didn’t want to increase the board size since bigger boards cost more money. The biggest challenge was finding a switch which would fit- in the end, I went with a 6mm switch which *just* fits. Of course, removing the LED lights and changing the display will require a significant rewrite of the code, but there are good libraries for the Nokia 5110 display so hopefully that won’t be too hard. Bought this bike salvaged for a project. As you can see, it had a lowside on the left side. I kept the front wheel, forks & frame as they were straight. Selling all the parts I don’t need and that are in good condition. While some of the parts here probably don’t belong on a show bike, everything here is perfectly usable and I’d be using it if it was useful for my project. All parts are in very good condition unless otherwise mentioned; I threw away anything that was very damaged. Please be sure to check the pictures for more info. Did you bother to test this? 1. Emails I delete from the inbox come back after a few minutes. I’ve deleted the same messages 4 or 5 times now from my inbox. I guess you figured my delete key doesn’t get enough use already? 2. Still haven’t fixed the Snow Leopard/Exchange issue where Mail.app stops downloading emails after some random period of time requiring me to restart Mail.app. The good news is I can really tell my boss I didn’t see that important email! Thank you for being my excuse! 3. Can’t quit Mail.app. Yes, it just hangs every time. Have to Force Kill it. This is great since I’m restarting Mail.app 3-5 times a day due to #2. 4. When it starts back up, it often presents me with a random email I recently sent acting like I didn’t actually send it. It’s in my Sent Mail folder… did you send it or not? It’s a mystery! We all like mysteries right? 5. How many times do I have to read an email before you mark it read? You seem to have chosen to use a random number generator for that. I guess this was designed to mess with people with alzheimer’s or something? Outlook and Thunderbird are looking really good right now. The Rule of Law that is. @MatMladin OMFG. Why does DMG hate the racers so much? Even NASCAR wouldn’t run and they have cages. Just total f**king insanity.